Some sunflower potholders. I also made some double-handed casserole mitts to match. I put a large pocket on the outside for holding a pattern book. And on the inside, I made a pocket with a row of tall “channels” to hold the knitting needles a row of shorter ones to hold small scissors, crochet hooks, row markers, etc. Hope the rest of your week goes well. And I hope that nasty virus stays away from your house. I’ll be back with more creations soon. This entry was posted in Fall, Sewing/Quilting. Bookmark the permalink. 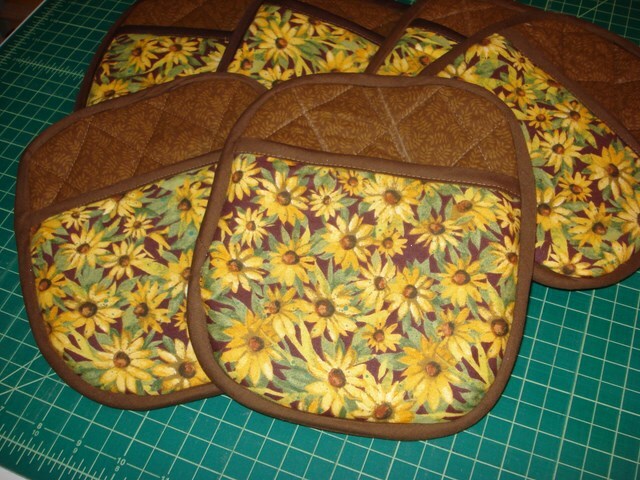 I love the sunflower pot holders! Super cute. And the knitting/crochet tote is great. You figured out how to make it organized, fashionable and it looks like it will hold quite a bit of yarn to. It really turned out nice. The memory pillows are so special. I bet that your co worker loved them. I should make some with some of the clothes I’ve saved. I finished 4 small quilts in the last month or so. I made one for my sweet baby at his house and one for at our house when he is here. Then I made two rag quilts. One for my sisters granddaughter and one for.. Well I’m not sure yet lol just had leftovers and made another one. I’m going to make a couple of table runners soon. I’m really happy that you’re up and about and feeling well enough to hang out in your sewing room.